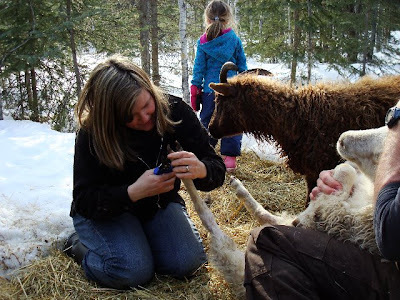 A few weeks ago, I asked our neighbour Florian (from Big Bear Ranch) if his girlfriend, Steffi, who is visiting from Austria and is a veterinarian, had any experience trimming sheep hooves. He called back a day or so later and said she did and they would be willing to come over and give us a hand. Have I mentioned lately how much I appreciate our amazing neighbours? ...notice Brownie gnawing on his overalls...we figured it couldn't have been too traumatic an experience since this picture was taken after she had hers done! 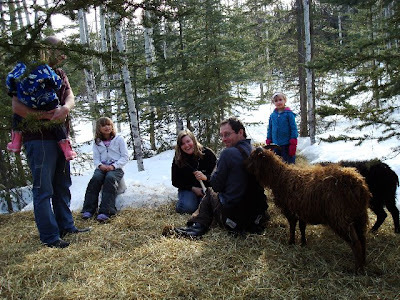 Stay tuned for Sheep Maintenance - Part 2 - Rooing and hopefully, Part 3 - Sheep Shearing. Aside from being a top-notch sheep wrangler, Florian is an incredible photographer...he just updated his blog with new shots from Europe and they are fantastic. Check them out here.